In-House Financing Available! We Report to Trans Union! Build or Repair your Credit Today! No credit or bad credit car loans aren’t as rare as unicorns, but they can be just as fantastic. An auto finance company such as Buy and Drive Autos has all the resources in place to deal with customers of all credit types, even ones with no credit or bad credit. Companies such as Buy and Drive Autos deal, in part, deal in what is called “subprime” financing, which is another way of saying that the credit levels involved are less than perfect. The special processes used by Buy and Drive Autos equip us to give subprime car buyers the same customer service experience as everyone else. This means that if you have no credit or bad credit, you don’t have to put up with confusing websites or rude customer sales agents. We will treat you the way you're supposed to be treated..
No credit? No worries. Click here and apply. If you make timely payments, an auto loan will help you build your credit if the lender reports your payments. Buy and Drive Autos reports to Trans Union. "Call for instant approval. 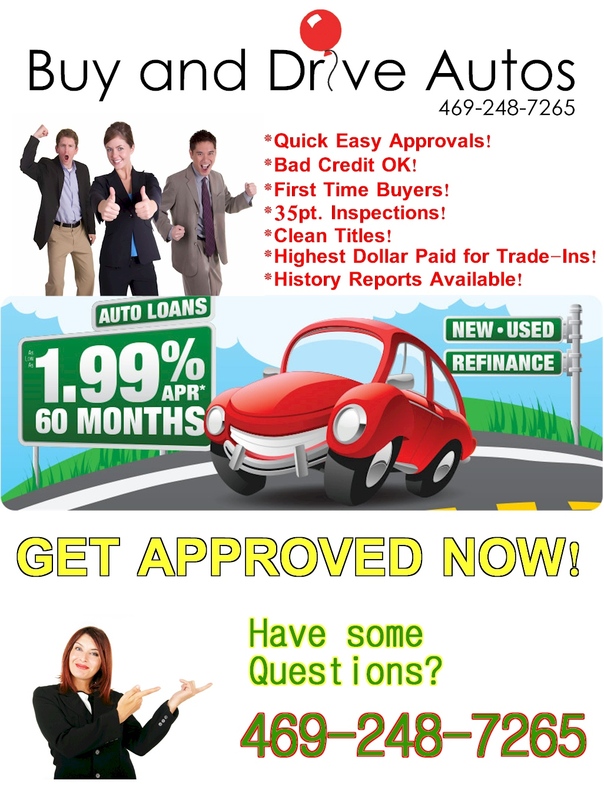 We can get you approved in under 10 minutes!!!!" All information is kept strictly confidential and is shared with no one. Sales Tax, Title, License Fee, Registration Fee, Dealer Documentary Fee, Finance Charges, and Emission Testing Fees are additional to the advertised price. What if I don't have money to put down? What if I'm a first time, buyer? What if I'm upside down in my trade? Being self-employed in most cases is not a problem. Trade-ins are welcome - running or not. If you owe money or have a clear title we can help. Many of our customers have had repossessions in the past. Our business is helping you, the customer, re-establish credit. Whether its a discharged chapter 7 or an active chapter 13, we have many lenders that specifically specialize in auto loans for people who have this specific need. We have many programs that either allow you to put zero money down or when down payment is required, allows you to defer all or part of it. With approved credit. The interest rate is determined by the lender. In short, the greater the risk they feel exists the more interest rate they will apply. Everybody changes jobs. What they are looking for is your ability to repay the loan. Being on disability does not hinder your ability to obtain financing. As far as Social Security goes, Who could argue that you have a pretty secure income. The usual minimum income required is about $1,500 per month but varies from lender to lender. All of our loans are 100% bank financed and payment history is reported monthly. What if I'm a first-time buyer? We have many programs for first-time buyers. In most cases, we can get a little extra help from the bank to overcome negative equity. This is determined by several factors: amount of purchase, interest rate, term and down payment.